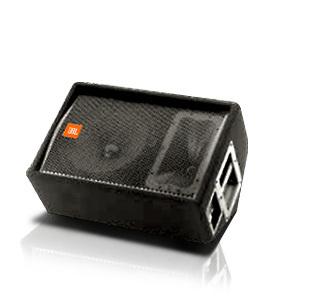 JBL JRX112M Stage Monitor Loudspeaker DJParts - All Variety of Parts that DJ Needs. JBL 12 in low frequency driver with a 64 mm (2.5 in) diameter edgewound ribbon voice coil which provides more cross-sectional wire area in the voice coil gap than round wire designs, for greater efficiency and power handling. Progressive Transition™ high frequency waveguide provides superior coverage control, reduced distortion, and smoother frequency response. Attractive 18-gauge hexagon perforated, steel grille protects components from damage. Dual-angle pole-mount socket allows the speaker to tilt 10°for more uniform audience coverage.